So, you fell in love with a colorful Betta at a local fish shop and want to bring him home. What are you going to need to keep your new friend happy and healthy in your home? This article will show you how to properly set up and maintain a tank for your Betta. What to feed and water parameters are discussed on the Food and Water page. All the photos used to illustrate products are links and you can click them if you are interested in purchasing that product or just getting more information about them. There are a lot of misconceptions about Bettas that say they can live in a small container or jar that sits on a coffee table, and they will do just fine. The fact that they live in these conditions just shows how hardy these fish are. Bettas, in their natural habitat, live in in the shallow waters of Thailand (formerly called Siam, hence their name), Indonesia, Malaysia, Vietnam, and parts of China. These areas are home to acres of rice patties. This water is usually shallow, muddy and it does not have currents. 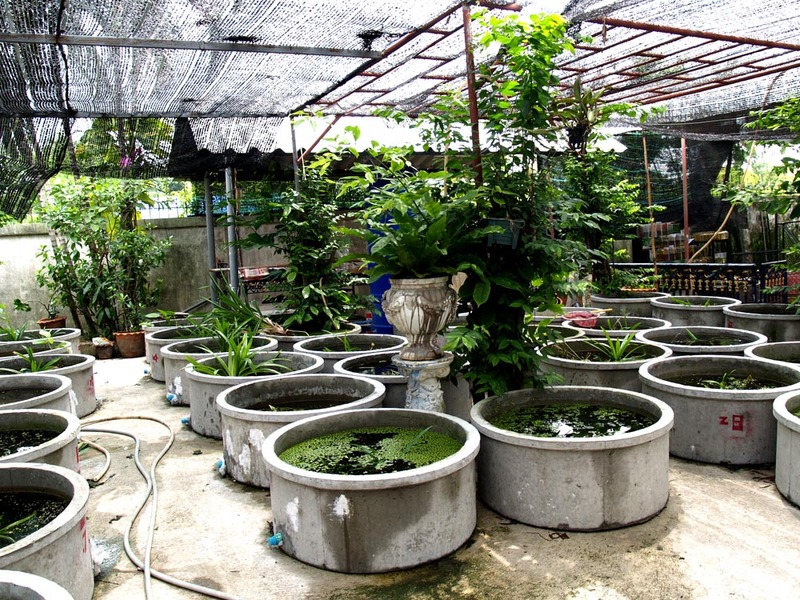 Many Bettas found in pet shops today are raised in outdoor pools in Thailand. Thailand enjoys a tropical climate that is typically high in both humidity and temperature. During the hotter part of their dry season, average temperatures climb to about 93 degrees, but it is not unusual for highs during this season to reach 105 degrees. So, creating the ideal home for your Betta is going to mean you need to make his home is warm and it needs to have very little current. The best home for your Bettas is going to be one you can heat and also filter. A small tank is going to be easier to do this with than either a vase or bowl. The minimum volume of water should be 5 gallons. If that seems like a lot of space for a single fish, you can divide this tank and keep two fish. Bettas can be very aggressive to their own kind, so you do not want to even try and keep a male and female together in an undivided tank this size. Either glass or a acrylic tanks will work fine. Glass tanks are heavier but they do not tend to scratch very easy. 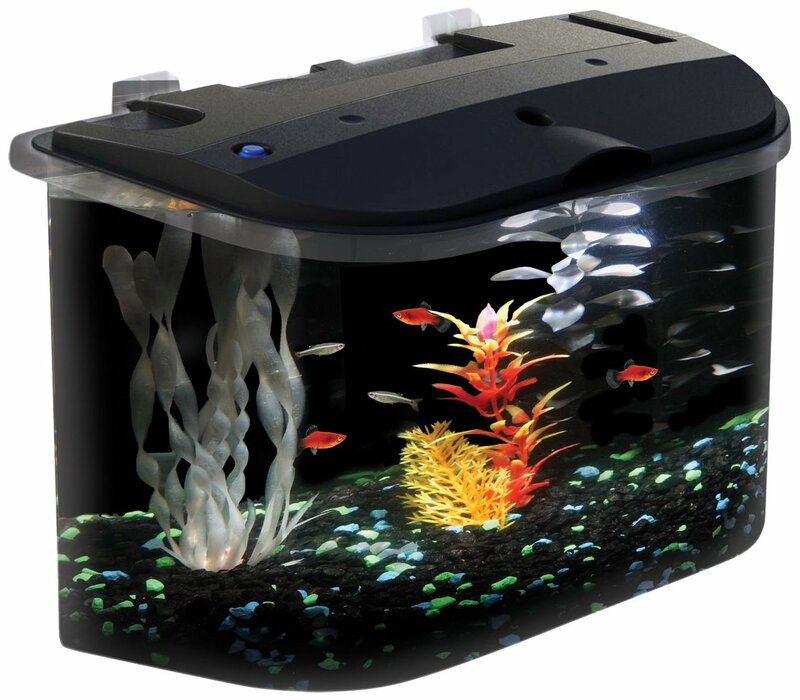 The acrylic tanks do scratch if you are not careful, but they come in stylish shapes making them more of a decorator piece then just fish tank. Any tank you get you want to make sure you have a good fitting cover. Bettas are very good jumpers and can find their out of a tank and onto the floor without a good cover on the tank. After you decide on a tank the next thing you want to get is a heater. Bettas like water temperatures around 80*-82*.Water in a bowl tends to run about 4* cooler than your room temperature. With average home temps around 72*, you can see Bettas kept without a heater are going to have water temps in the upper 60’s, much too cold for your tropical Betta. Cooler temperatures also make a Betta prone to diseases such as Velvet . A small watt heater that has a variable setting will get your water to the ideal range. When looking at heaters you may want to consider some bells and whistles like auto shut off if the heater is removed from the water while still plugged in. Glass heaters can shatter if removed from water then put back into it, even if only out a few seconds. They may also over heat when out of water, so the auto shut off is a good way to keep from accidentally losing your heater. Another consideration is a protective covering over the glass to avoid impacts shattering the glass. All these “upgrades” add a little to the overall price of your heater, but even with all the extras you should find a suitable heater for $15-$20. If you can not get a variable temperature heater you can often get smaller watt heaters that will keep the water 78*. Though they will not get the water to the ideal range, they are perfectly fine as they will keep the water warmer than room temp. All tanks need to be filtered to keep the water as healthy as possible for your new fish. Ammonia is a a waste product produced by fish and will quickly build up to toxic levels, There will also be organic matter that will be seen suspended in the water column. A good filter will take care of both theses issues. Since Bettas prefer still or slow moving water, choose a filter that does not create a lot of current. There are many types of filters on the market today, but for Bettas we recommend a box or a sponge filter for your tank. Both are hooked to an air pump with tubing and can be controlled by size of the pump used to drive them. Choose a smaller pump to get good circulation without a high turnover of gallons per hour. 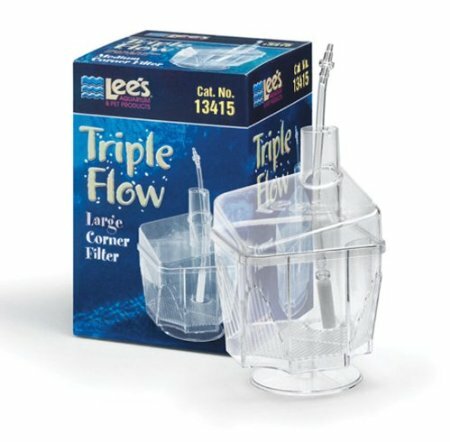 For a more in depth discussion of the types of filters available today, see our Filtration page. 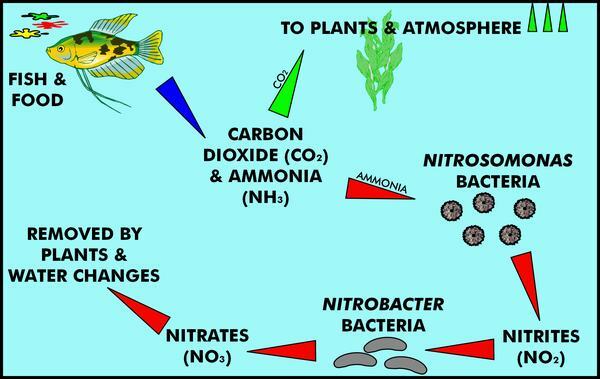 Every tank goes through something called the nitrogen cycle. The nitrogen cycle is going to affect your water quality on a daily basis. Fish produce ammonia and that can cause problems. Lucky for us Mother Nature has bacteria that like to consume ammonia and turn it into nitrite. Bad thing is nitrite is not any better for your fish than the ammonia. Mother Nature has more bacteria that likes to eat the nitrite and change it into nitrate. This substance is not toxic in low levels, but in time can be destructive to your fish. Regular water changes will keep this substance down to reasonable levels. Some aquatic plants in the tank will also help you manage your nitrates. Developing these bacteria to breakdown the ammonia and nitrite takes time and is called cycling your tank. This “cycle” can take 1-2 months to get balanced and complete. So in the beginning you will need to do regular water changes to keep the water healthy and prevent stress and disease. For a deeper discussion of what goes on when you cycle, see our Nitrogen Cycle page. 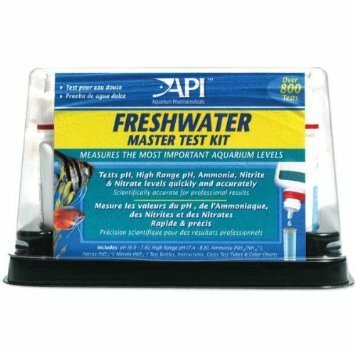 As a hobbiest it is a good idea to have a water test kit, and even more so when establishing a new tank. A master test will allow you to test several important water parameters. When starting your tank it is just the ammonia and nitrite you will be testing every few days. Any time either of them show a reading other than zero, you have toxic levels of these substances in the tank and will want to change out a good portion of your tank water to get them down. Initially the ammonia level will rise and will start to feed nitrifying bacteria. Your water changes will keep the water safe and allow these bacteria to reproduce to the point that any ammonia produced is quickly turned to nitrite. Then you will see the ammonia is holding steady and the nitrite is beginning to rise. This tells you that you now have some beneficial bacteria established that is converting the ammonia to the nitrites. Now another type of bacteria is being fed and will need to increase in numbers to handle the rising nitrite levels. Again, more water changes until it too will hold steady. When the nitrites start to rise you also want to start testing for the nitrates. This is not as toxic as the other two, but you still do not want high numbers here. Again, your water changes should reduce the amount of nitrates in the water as well as “refresh” it’s chemical makeup. Regular testing of your water parameters will tell you where you are in your cycle. In time the tank will balance with bacteria developed to handle your typical bio load. You should be able to go a week and and have both ammonia and nitrites barely register. Then you are changing out water and removing the nitrates as well as bringing back elements in your water that are depleted like trace minerals. 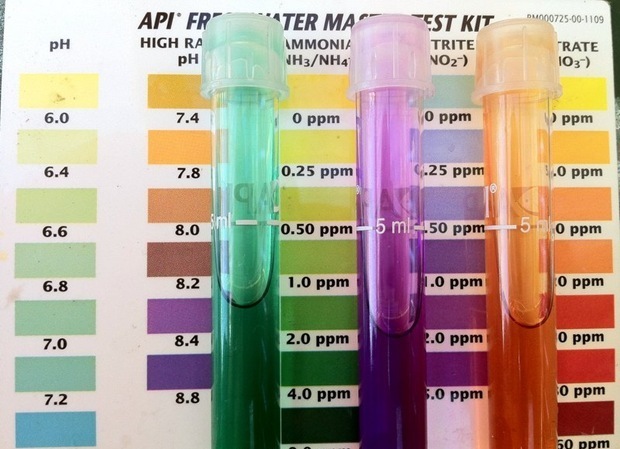 It is still a good habit to test your water parameters when you do your water changes. They will alert you to unhealthy conditions that may weaken your fish and open them up to disease. If you visit any forum on fish or Bettas, and look for help with a sick fish, the first thing anybody wants to know is your water parameters. A really good video on how to use a test kit. *** Watch for rough edges. If plants or other items are very rough it may tear at your Bettas long fins. *** If you choose rocks from out doors you want to make sure and wash them thoroughly. And don’t choose the rocks from an area that may have been sprayed to kill weeds. Also, some rocks, such as limestone will leach into the rater and increase hardness, Choose more inert stones. *** Pieces of natural drift wood can also be used. With some driftwood it may leach tannin into the water and give it a nice amber color. These tannins will also naturally lower your pH. You can either presoak the tannin out of the wood or just use water changes to keep it under control. Again, look for smooth edges so as not to tear the Bettas fins. Now that you have everything to provide a good home for your Betta, take a quick trip over to the Food and Water page and find out a little more about water and also what foods will make the best choice for your fish. Though aggressive to their own kind, Bettas are peaceful fish and they do get along with other fish as well as snails and shrimp. Apple snails are a good choice as tank mates because they are great scavengers and will eat excess food and control algae. 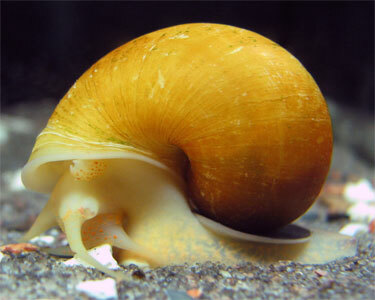 These snails come in a variety of colors and shell patterns and can get the size of a baseball. If these can not be found, any other type of snail is a good addition as well. Bettas tend to ignore the snails, but some Bettas seem to enjoy pecking at the larger snails as the climb the glass until they come loose and fall to the bottom of the tank. I think it becomes an amusing game to the fish and does not seem to bother the snail at all. Shrimp are becoming very popular to keep and they also make nice tank mates for Bettas. Though often sold as live food for larger fish, Ghost Shrimp are neat pets and you can see right through their clear bodies. 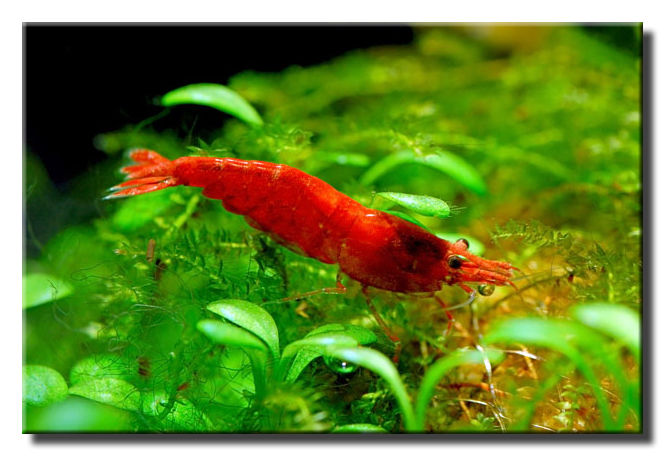 Red Cherry Shrimp are also favorites and can get up to 1 inch long. Since they produce little to no waste, you can have several shrimp in with your Betta. The shrimp will also reproduce, giving you some to share with friends or maybe trade to your local fish shop for more fish supplies. If you decide to keep shrimp, make sure there is plenty of cover and keep the Betta fed, of he mak deicde to snack on your shrimp. 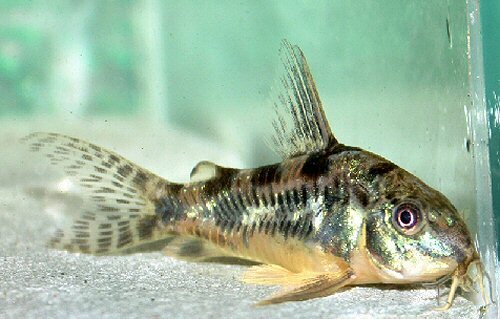 Cories or Corydoras Catfish are a delight in a tank. Cories are also scavengers and are bottom feeders. Since your Betta tends to swim at the top levels of the tank, squabbles over territory will rarely happen . These little catfish are a peaceful and do best in groups. For a 5 gallon tank a pair will do nicely. If you have a larger tank consider getting four. 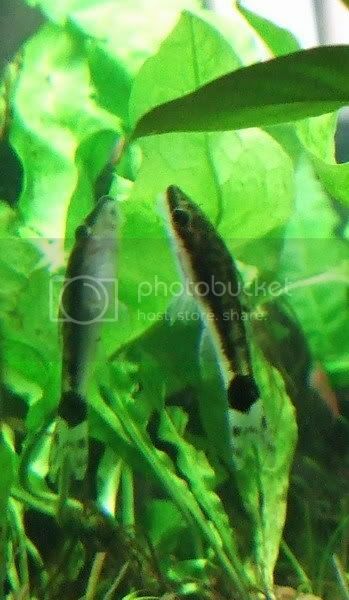 Otocinclus Catfish, or otos for short, are another bottom feeder like the cories. However, they are much harder to acclimate because they are not bred in captivity but are caught from the wild. This make them more sensitive to any changes in water conditions. But once your oto survives the first 1-2 weeks, they should live for a long time provided that the water remains stable and clean. Peaceful and easy going they make good tank mates for your Bettas. *** Many of the tetras because they swim fast and like to nip and tear a Bettas long finnage. *** Goldfish because they are cold water fish and prefer water that is much higher in pH than your Betta would like. They are also very messy and need good filtration. Filtration for a Goldfish would be too vigorous for a Betta. *** Guppies also do not tend to be good companions. They, like the Goldfish, prefer water that has a higher pH and their bright colors often make them a target for an aggressive Betta.